As a bonus, here is Xerox "Rooms" for X Windows. 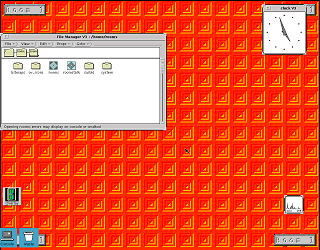 Rooms is a program that simulates multiple desktops under Sun OpenWindows, in this case running under SunOS 4.1.4. 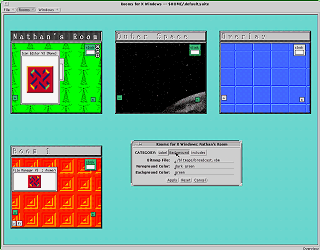 A Windows 3.1 version also exists. Unlike most multiple desktop programs the desktops are linked together by "doors" like a set of rooms might be. In a way it kind of reminds me of Microsoft Bob... without the accessories, or the assistants, and Bob moved out leaving the place deserted. 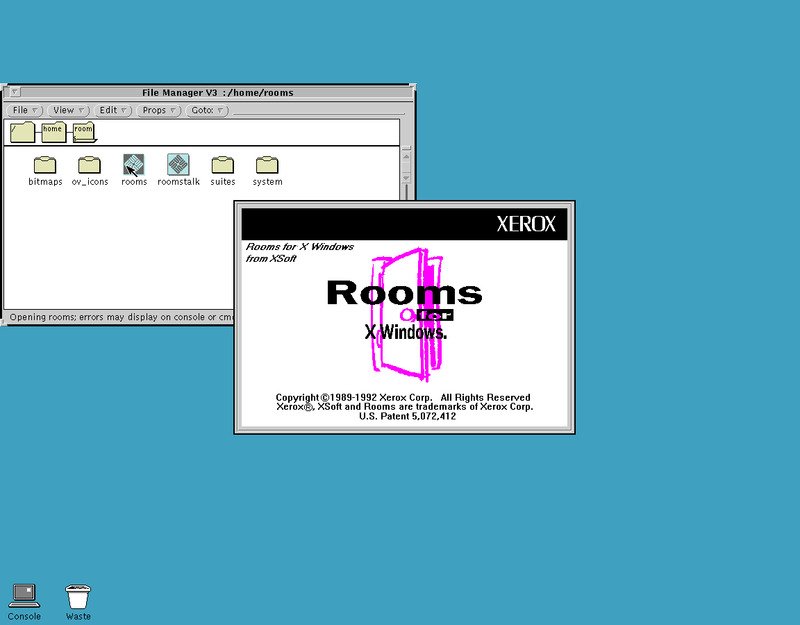 Starting Xerox Rooms from the SunOS OpenWindows desktop. Wait, I thought that said Xerox Rooms, not 'shrooms! By default, it starts out with only two rooms. "Room 1" and an overlay room. "Door" icons appear in each of the rooms. Clicking on a door icon causes the door to animate open, this little guy appears, and then a different desktop or the Overview window is displayed. The "Overlay" room (not to be confused with the "Overview" window) is used for windows that you want to appear in all of the rooms. In this example I have switched to the Overlay room and opened the clock and performance meter. The OpenWindows file manger is still open and running but is not visible from this room. Additionally, the properties of a room can be edited to include or exclude applications from other rooms. In any room moving the mouse cursor to the left or right of the desktop and clicking moves to the next or previous room. Clicking on the top of the desktop opens the overview window. 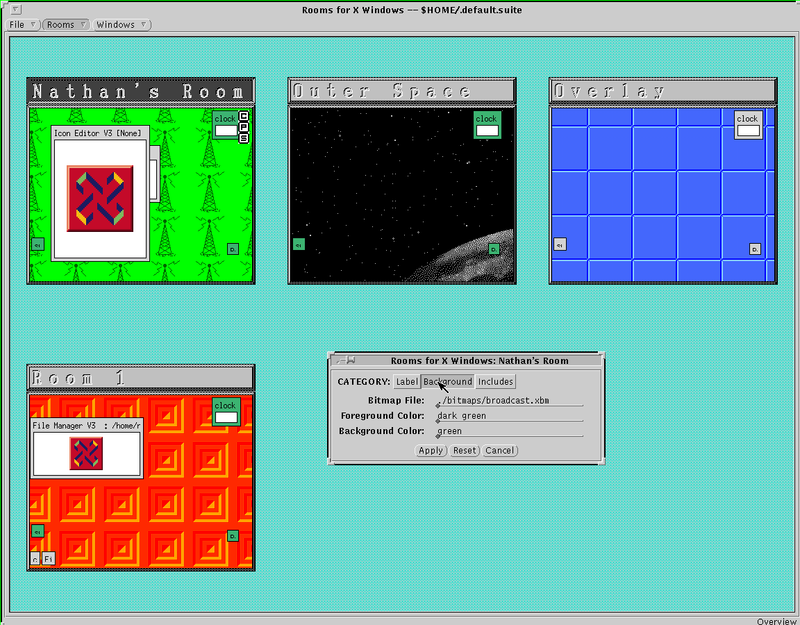 Switching back to the first room, the OpenWindows file manager is now visible again, and the clock and performance meter are still shown. This is the Overview window. From here you can go to a different room, create new rooms, edit their properties, and delete rooms. In this example I have added two additional rooms. The overview also shows the position of each application in each of the rooms. 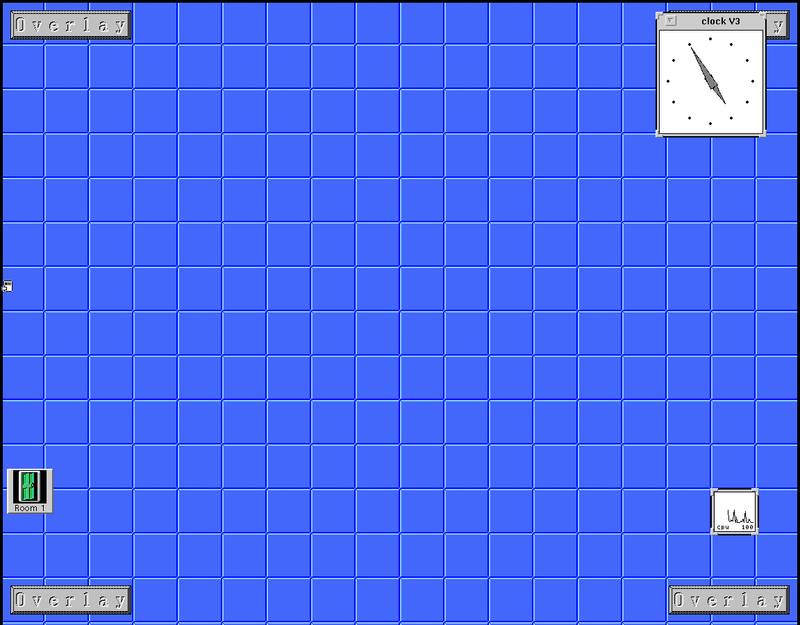 Note that the clock and performance meter I just opened in the Overlay room are now present in each room. This also shows part of the properties dialog. I'm pointing this out because the software tries to make the desktop more friendly, but the properties editor fails at this. In this section there is no way to browse for a background filename, you must already know what it is, furthermore the Overview window is modal so it is difficult to open a new file manager window from here. To select a color you must type in the name of the color, requiring you to know the names of all the available colors in advance.